According to the MSA, its AIS integrated service of vessel traffic in real time can cover all of coastal and inland waters in China and some of the waters in the world. The AIS Information Service Platform by China Maritime Safety Administration (MSA) was officially launched at the beginning of this month, and real-time AIS data in China's coastal areas and rivers are now traceable. AIS data of around 35,000 ships are available for the public every day, according to China MSA, and ship information can be searched in terms of real-time location and speed. The platform also integrates port information, tides forecast and meteorological information, stated China MSA, and the highlight of this platform is that it overlaps land and sea charts together. "AIS provide accurate information of ships, and can greatly shorten the time of search and rescue in case of [an] accident," stated Xu Jixiang, a senior official from China MSA. He added that with the help of AIS, the maritime departments will be able to prevent collision accidents and track hit-and-run ships. China also developed the ship-based Beidou AIS terminal in January 2014, combining China's Beidou navigation satellite system and AIS, and has applied it on maritime vessels and survey ships. China's BeiDou Navigation Satellite System was officially recognised by the IMO in November 2014 as part of the organisation's World-Wide Radio Navigation System (WWRNS) at the 94th Session of the Maritime Safety Committee (MSC). Currently, BeiDou's accuracy is within 10m, and functions even to sub-metre levels in some areas. By the end of 2015, its accuracy will be improved to a 1m level and to a centimetre level by the end of 2018. 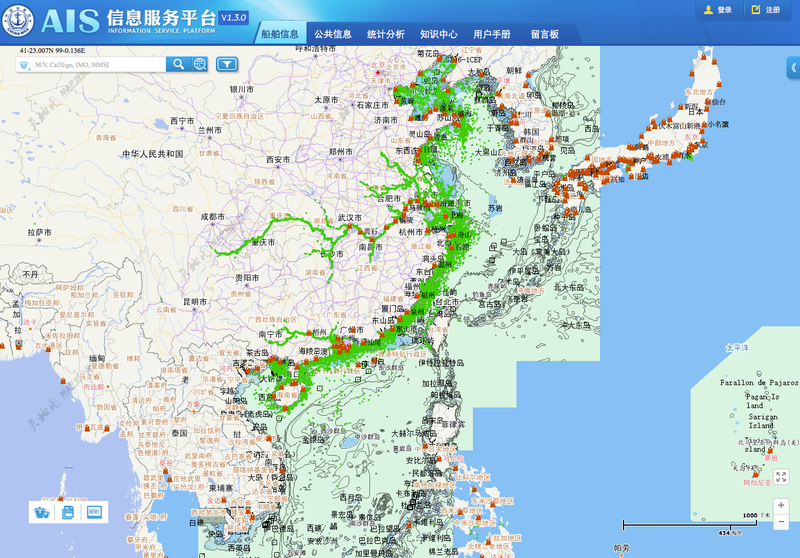 Data from China's Ministry of Transport showed that as of May 2013, China MSA has established the world's largest shore-based AIS network. According to the requirement of international convention and relevant standard, the MSA has built 402 land-based AIS stations in China, covering the whole country's coastal and inland river high-grade waterways and relevant waters. Windward earlier reported that one per cent of all ships around the world are giving out fake identities via their AIS transponder systems. Windward said that its research has found that this is a fast-growing trend: over the past year, there has been a 30% rise in AIS manipulation of IMO numbers (a ship’s identity number, which is not supposed to change throughout its ‘lifetime’), with over 1% of the AIS-transmitting ships now reporting false identification data. Windward also revealed that only 41% of ships report their final port of call, a quarter of global vessels turn off their AIS at least 10% of the time and from mid-2013 to mid-2014 there has been a 59% increase in the use of GPS manipulation. Chinese fishing vessels account for 44% of GPS manipulation. The company said it expects such figures to grow as more and more data comes online due to increased regulations and ships seeking to conceal their activities become increasingly aware that AIS is being used to ‘watch’ their activities.